Markarian's Chain is a string of galaxies within the Virgo Cluster, the closest cluster of galaxies to our own Milky Way Galaxy. The chain appears to form an arc, and at least seven of the members of the chain share a common motion. 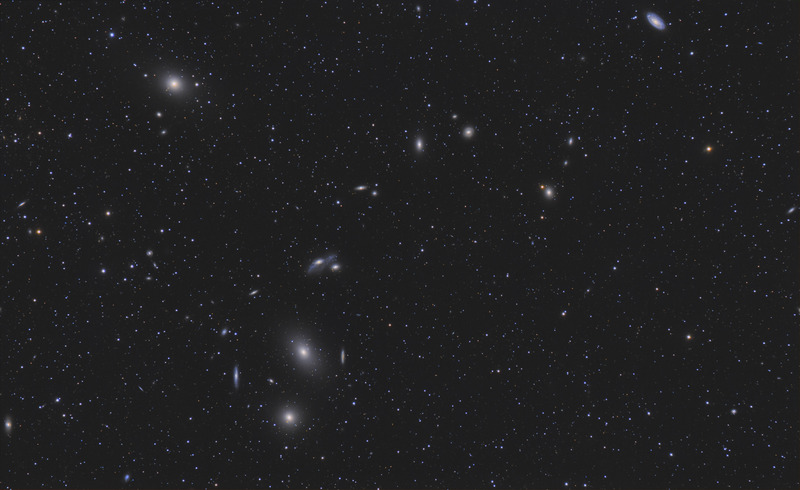 This widefield image, centered on Markarian's Chain, shows a 3.3 x 2.0 degree section of the Virgo Cluster. The cluster itself contains approximately 2,000 galaxies over an area roughly 10 x 10 degrees. This image captures a total of 642 galaxies, the majority of which are Virgo Cluster members. The high resolution annotated versions of this image show the locations of 55 Messier, NGC, and IC catalog galaxies in addition to 587 PGC (Principal Galaxy Catalog) galaxies. Dominating this field of view are three huge lenticular galaxies catalogued by Messier. 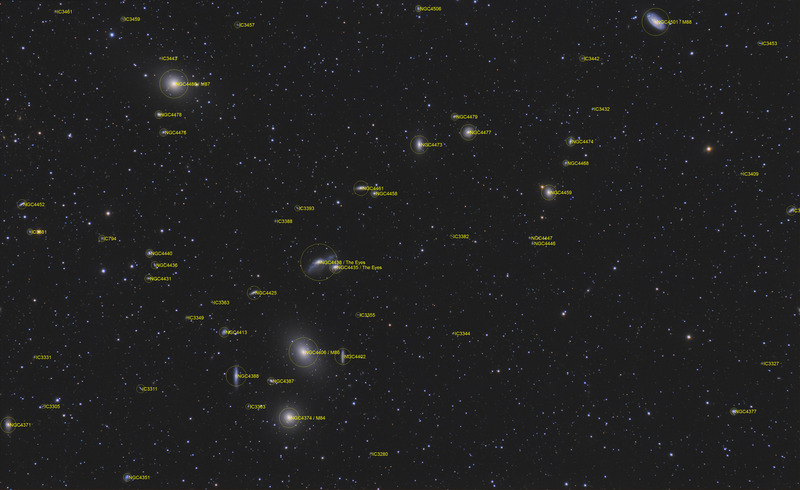 M84 is the large galaxy at the bottom center of the image, M86 is just above it, and M87 is towards the upper left corner. Each of these tremendous galaxies is estimated to have 400 billion stars or more. In this image, North is to the right. This image is cropped to 97% of the original image. Software Used Images Plus 5.75 for camera control. Images Plus 6.0 for calibration, stacking, DDP stretching, feature mask, multi-resolution sharpening and smoothing. Photoshop CS5 used for levels and curves, match color, lab color, cropping and selective color. Pixinsight 1.8 for additional stretching, dynamic background extraction, and image annotation. HLVG for additional color correction, Gradient Xterminator for gradient removal. Carboni Tools for additional noise reduction and smoothing, Focus Magic for focus restoration. Registar 64 for stack alignment and color alignment. Notes I had previously imaged the M84 and M86 section of Markarian's Chain with my C8 and Canon 450D. That combination gives a somewhat more detailed view of Markarian's Chain, but I'm very happy with the plethora of galaxies I was able to capture in this much wider view. This is also the first galaxy field of view I've tried to capture with my Nikon 600mm lens. Although the lens is a bit shorter focal length than is optimal for most galaxy images, I think it worked out very well for this extraordinary section of sky.